Despite some tough economic times, there have been a lot of positive changes on Smith Street in the last year and in the last few months in particular. Smith Street is one of those streets that has amazing potential to be a great urban masterpiece with shops and services lining its curbs all the way to North Providence and great communities branching off in all directions. This used to be a corner store that was typical for the area, but a few months ago chain link went up around the building and I assumed the worst. Much to my surprise, within that fencing came renovations not demolition! Clearly, much work was being done on the interior, but even more visible was the transformation taking place outside. New awnings, brick pedestal-flanked iron fences, new windows, and new brick siding have totally metamorphosed the property. Since their opening two weeks ago, the place seems busy. I stopped in the other day to pick up a menu. Inside are both pizza and deli options, some tables and chairs, and typical corner-market groceries. Overall, I think this is a fantastic addition to the neighborhood, and I look forward to stopping in more frequently on my way home. The Valueland property has been vacant as long as I’ve lived here (over 4 years now), and the thought of there once being a grocery store on Smith Street seemed like such a tease. Fortunately, ALDI Markets saw the potential in the site, and recently renovated the building, repaired the parking lot, and the doors to the store are now open. I have some mixed feelings about this property, however. I’m pleased that it’s a shopping center that’s build right up to the sidewalk with the parking lot mostly in the rear. There is some additional lighting that casts on the sidewalk at night, and with the new street trees, it already feels like a safer place to walk. However, the entrance to the Aldi store is not accessed from this side of the building. Instead, there is a long wall along the sidewalk, not windows and doors to keep eyes on the street. You have to walk around to the rear of the building to enter the store. Apparently, the doors that are on the street side are for subdivisions within the building to sublet to other businesses. Though those spaces have been vacant since the store opened, a “coming soon” sign recently went up indicating that a Little Cesar’s is moving in. I’m also not exactly impressed with Aldi’s grocery selection. This doesn’t seem to be the kind of store one could shop in exclusively without maintaining a diet consisting solely of flour and corn syrup based products. I was pleased to see that another structure went up on the property, again built to the sidewalk and reducing the quantity of pavement along side the property. This new building went up in a matter of days and is now a national chain auto parts store. As Bret pointed out in a recent post, this location is also on the mend. Though personally, I’d love to see nice restaurant here with patio seating, a nice new awning, and clever lighting, alas it appears that a laundromat will be the new operation; giving people a place to wash off any accidental stains after dining across the street on a few wienies-all-the-way. 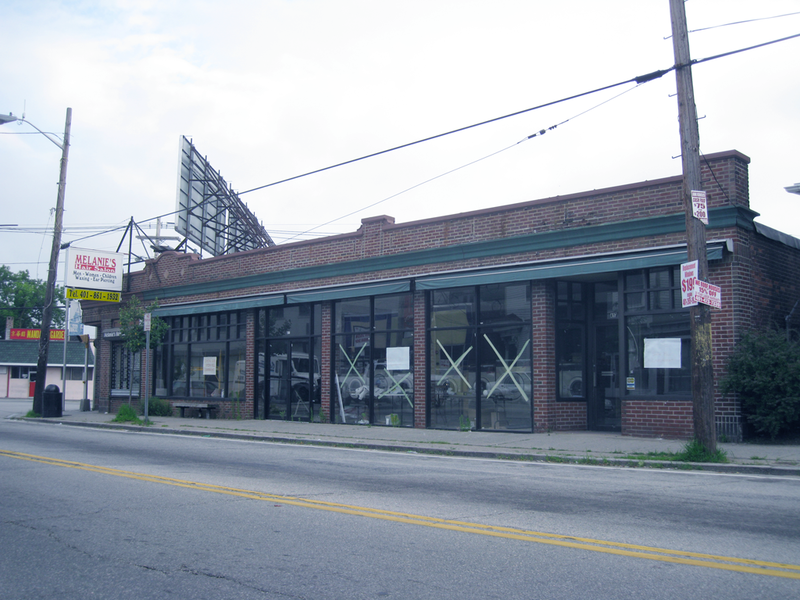 Despite the rather boring necessity of a laundromat, it is a service that I’m sure will be used, and seeing all these buildings re-used and improved is a great stride forward for Smith Street. The trend along Smith is encouraging, and the feel of the streets in that stretch of road is completely different with the opening of Aldis. That stop has quickly become one of the most popular along the 57 route, and there is real enthusiasm about the store and plaza from everyone I talk to. A bit farther down the road in Elmhurst the story is a bit more uneven. 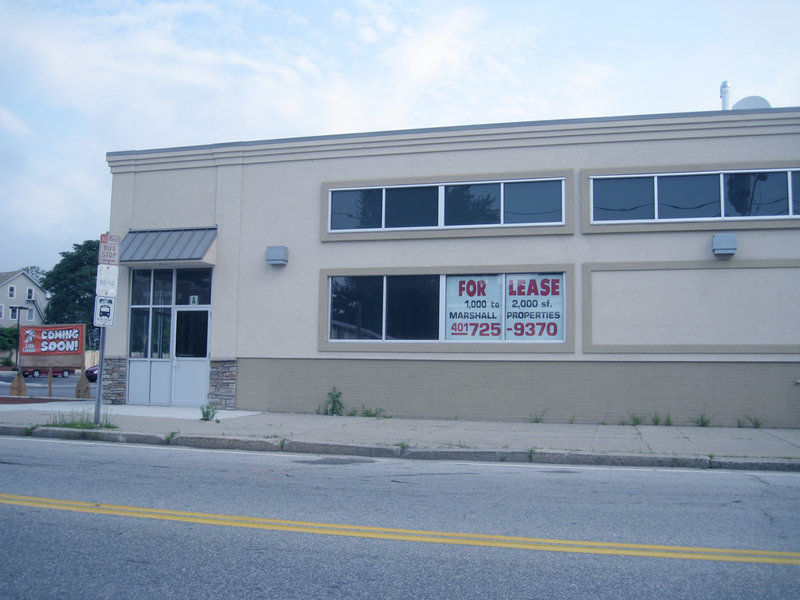 Salon 888 opened a few months ago, so the corner of River and Smith is fully occupied, but two vacancies opened recently in the LaSalle Bakery block, at the corner with Academy. Lasalle Pizza shuttered last week, and Topiary Floral moved into a vacancy at the corner with River. Also there seems to be problems keeping tenants in the plaza around Elmhurst Pub. Since these recent vacancies are well-located and in maintained buildings I would agree that the trend is upward, but apparently stalling out in the general downturn. I was disappointed when I saw the layout of the ALDI lot. It’s not only unfriendly to pedestrians, but unfriendly to cars. 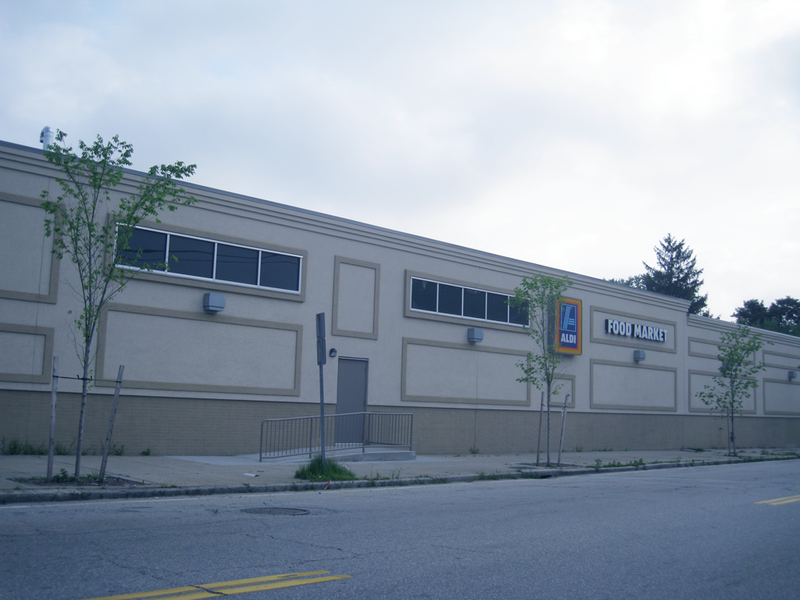 I expected ALDI to be located right where Valueland was with a door on the Smith St sidewalk. It is redeeming that there is a door right on the sidewalk. Hopefully it’ll be something needed for the neighborhood, like a CVS or Walgreens and maybe a bank. I had no idea that LaSalle Pizza closed. They were really good for the neighborhood. That stinks. Very sad to see LaSalle Pizza close… I thought they were quite good. Federal Hill and Wayland Sq. We are also working with the City on getting new trash barrels installed…should see this week if the weather calms down! Need to find out if there is a business association in Elmhurst…don’t believe there is but I think I remember Councilman Solomon saying that he is going to be working soon to help establish one. Don’t know if Smith Hill has one either (?). Closer to the State House, I Love Mexico opened up a few weeks ago as well. My girlfriend grabbed a menu last week, though it isn’t exactly what I was hoping for (chicken fingers, a 5.99 burger special??). I Love Mexico is new?.. interesting.. never looks like there too many people in there though.. but have to check it out. I have to say, I am pretty pumped about Aldi’s. The only thing really that annoys me is their lack of consistant producem but other than that.. Sweeet deal! Also pumped about Family Dollar coming in. I Love Mexico used to be Garcia’s with the black awning. Little Sleazer’s is open, jonesin’ for Cheesie Bread. I Love Mexico s such a cute little restaurant! There wasn’t a burger special when I went, but a burrito special for $5. They gutted out Garcia’s and it’s really nice inside. The waitstaff was so sweet too! Found this site, very interesting information, considering I grew up in that neighborhood in the 60’s and 70’s. Where Aldi’s is now, was a Big “G” supermarket (which was a local chain in the day), with the doors opening at the far end of the building into the parking lot, opposite the Smith Street side. In the Smith/Ruggles Street corner of that building was a laundromat that was stepped up from the side walk… And the seperate building on the corner was a hardware store, don’t recall the name though. Where you identified the Earthen Vessel on Smith Street, was a string of seperate stores back then. The right most was a liquor store, Smith Hill Liquors, if I recall correctly… Next to that was Levi’s Dry Goods, which was always a good source of cheap toys and pea shooters… And the leftmost was a Fotomat in the early 70’s. At the intersection, was a Rexall Pharmacy, Gilbert’s Pharmacy… The empty lot across from there was The Grade “A” Market, a neighborhood grocery and butcher shop. To the left of The New York System, was Gil’s hardware store… And the empty lot at the corner of Duke St was an Atlantic Richfield gas station my grandfather attended. The condo’s on the other corner were Smith Street School… Attended kindergarten and first grade there… It’s amazing to see Smith Hill continue to revitilize itself and continue to live on! Thanks so much for that! It is really cool how the neighborhood does reinvent itself. Some of the places you mention I can definitely picture fitting in will on this street, and wish many of them were still there. I don’t suppose you have any old photos of the neighborhood from back in the day?